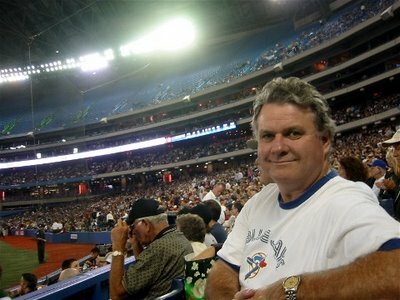 Tonight was the Jays' last home game and Gord and I had bought cheap tix a couple months ago for it. At the last minute, though, the tix that my company owns became available and they were given to me. Whoohoo! It was a great game! Toronto won, which right now puts us in second place in our division. We don't have a chance of making the playoffs but it was nice to see them win their last home game. Thanks for a great year, Jays! See you again in April!! 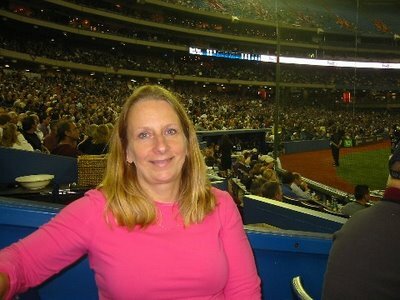 I won Blue Jays tix through a contest at work this week for tonight's game. Our company has season's tix but they usually give them to clients or prospective clients. This is only the second time I've gotten the tix this year (a couple weeks ago). As before, the sights and smells of the free hot dogs, popcorn, etc. from the $200 seats ahead of us taunted us. Alas, Toronto lost. We don't have any chance of making the playoffs but it would have been nice to win. My fav player, Eric Hinske, a former Blue Jay now a Red Sox ,was there but he didn't play. I waved at him (he was in the dugout) but he didn't wave back :( He was probably wondering who the psycho chick was. Ha! 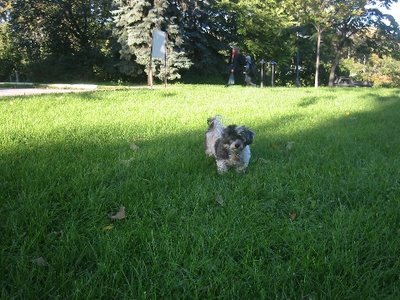 KC and I went to her favourite park this evening, Trinity Bellwoods Park. 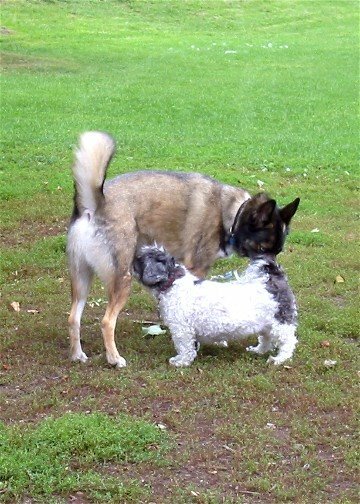 It was cool out and KC did a lot of running around and sniffing. Garrison Creek used to run through the Park at the north end and Crawford Street Bridge was built over it. 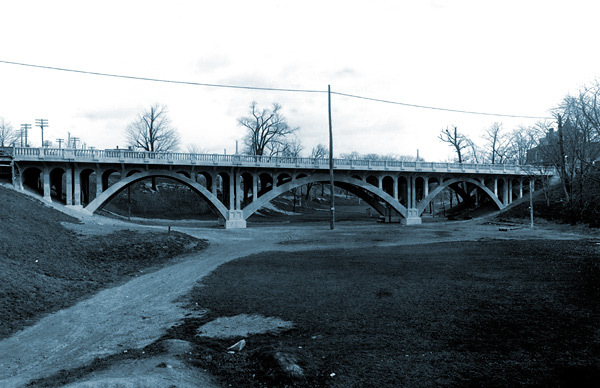 In the mid-60s, the Creek was filled in and pieces of the Bridge were removed and some were buried. Just south, you can follow the Creek's former path because its deep and wide shape is still there in places. 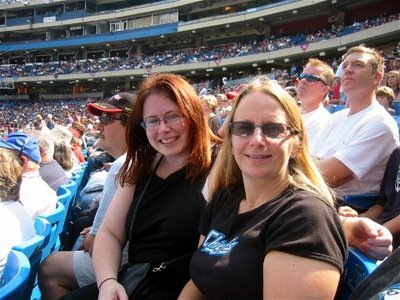 Liz and I went to the Blues Jays game today. It was a fabulous game ... we won! 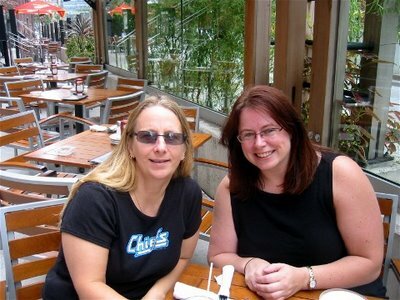 We had lunch at Jack Astor's before the game. 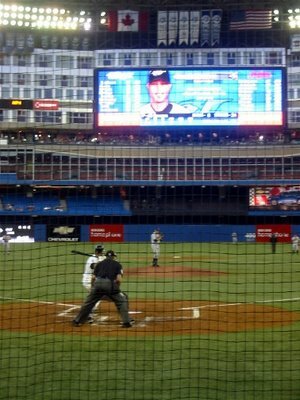 Our seats were great ... 17th row, just left of third base. And what's even better is that they were free! Gord and I have Rogers as our provider for Internet and cable. They own the Blue Jays and the Rogers Centre. We got a letter a couple weeks ago from Rogers offering free tix so, of course, we took 'em! 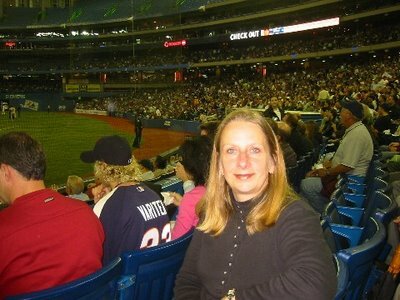 Liz hadn't been to a game in a while. At one point she was waiting for the intermission to go to the washroom. Alas, there is no intermission in baseball. It was a fun day and it was great to hang with Liz! Gord has been fencing for almost a year. He got interested in it through an event we did last year with Single Horizons. 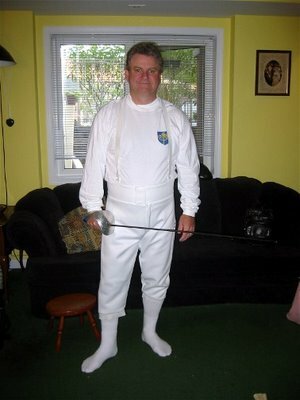 So he joined a fencing club called Beaches Sabre Club. He went into his first tournament today. This will give him ranking in the province and Canada. He's not sure how he did as he didn't stay for the whole thing but he doesn't think he came in last. They wear a white jacket (puncture-proof) over this outfit ... and then another jacket (metal) over that for scoring. Our computer has been dying for a while but we were going to wait and see if it would last until Christmas to get a new one. I'd had it for about eight years and it had served us well. We had changed mortgage providers in June and I got a call from the new one last week to say that the old provider had deducted too much in tax property taxes. A nice surprise!! They cut us a cheque and we got it this week. So Christmas came early for us! We started off with sustinance (aka lunch) at the Bellwoods Bar and Grill. 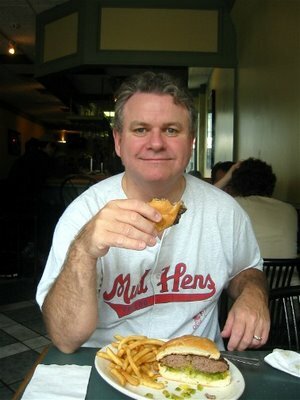 We had quite a burger (who knew a 16 ounce burger would be sooooo big!!??) and fries for just $5.50! We'd never been there before but will go back! The College/Spadina area is known for computer shops so that's where we walked to. We checked out five stores before we found the computer we wanted. 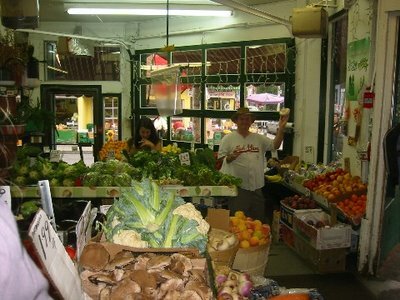 It was going to take a couple hours to get it ready so we headed to nearby Kensington Market. This car, parked on Augusta Street, was recently towed away but it's back. 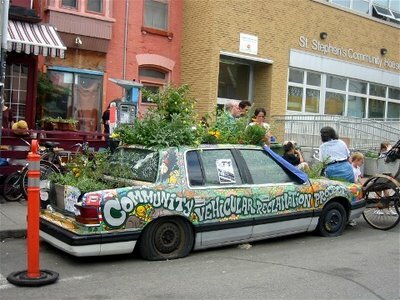 Yes, there are plants growing in it! Click here to read about it. We had a couple drinks to celebrate our new purchase! We picked up potatoes, a big mushroom and a pepper to BBQ with supper tonight. 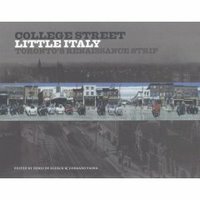 From Toronto.ca ~ College Street - Little Italy: Toronto’s Renaissance Strip charts the history of a community that is a microcosm of the larger forces that created the diverse culture of today’s Toronto. Through immigration, College Street has evolved as Canada has evolved with each generation and ethnic group leaving its distinctive mark. This anthology, richly illustrated with archival photos, details the settlement of many ethnic groups (primarily Italian, Jewish and Portuguese). 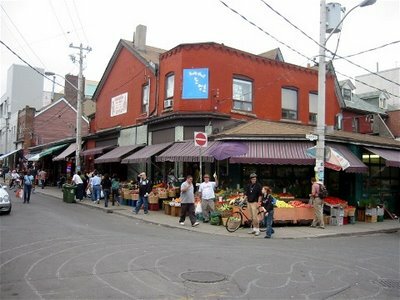 It reflects the architectural, natural, and urban footprint as well as the arts, culinary and high quality urban life for which Toronto’s Little Italy is renowned across North America. Little Italy is a neighbourhood just north of us so I found this book very interesting. I love reading about the history of Toronto, especially when it's just around the corner. From Amazon.com ~ Writing in a journal is all well and good, but when you're ready to share your musings with the world (and you think the world is ready to receive them! ), a blog is the way to go. This compact guide shows you how! Using big, bold full-color pictures and streamlined instructions, it covers just the need-to-know essentials that will get you blogging with leading free blog software--Google’s Blogger--in a matter of minutes. Best-selling author Elizabeth Castro takes you through each step of the blogging process--from acquainting you with the interface to setting up your blog, creating your profile, posting email, adding pictures and audio, and more. Occasional sidebars and tips point out other useful blogging tips and tricks. 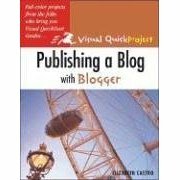 Very good book if you are just starting to use Blogger. Though I've been using it for over a year, I discovered a couple things I didn't know. Click here for lots of links, template tags, etc. that are in the book. From Amazon. com ~ Weblogs, frequently updated, independently produced, and curiously addictive, have become some of the most popular sites on the Web today. The Weblog Handbook is the first book to explain how weblogs work and explore their impact on the media landscape. There is no formula for creating a superb weblog but there are lessons to be drawn from maintaining one. In The Weblog Handbook, Rebecca Blood draws on her experience as an early participant in the weblog community to share what she has learned in three years of "living online." She explains how to choose among the available tools, even walking the beginner through the process of creating their first weblog. Along the way, she answers commonly asked questions concerning weblog etiquette, how to attract readers and the qualities that make a weblog stand out, alerting the novice to considerations and pitfalls they didn't know to ask about. I've been blogging for over a year and I found this book interesting because it talked about how weblogs came to be and various things such as etiquette, etc. David was a rising star in the Toronto financial world but was not all business. He was known on Bay Street in Toronto for his determination to improve his golf game, his cigars and his practical jokes. Colleagues would return from lunch to find a flashing message on their computer screen that was impossible to delete. When he wasn't working, David — or Barky, as his friends called him — was on the golf course. So, it's fitting that a patio off the trading floor at BMO Nesbitt Burns,was turned into a putting green named Barky's Way. He became engaged in 1996 on a ski slope, presenting a diamond ring to Cindy McLennan after they had both taken a spill in the snow. Mrs. Barkway, who was pregnant with the couple's second child (who she named David), accompanied her husband on his final business trip to New York and was on her way to SoHo when the World Trade Center was attacked. 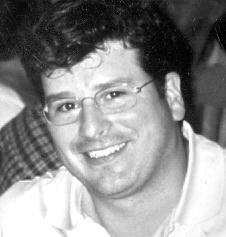 David was was visiting a client atop the World Trade Center's north tower when the first plane hit. 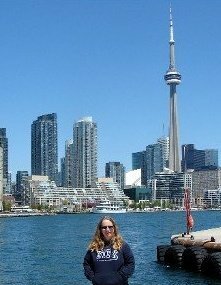 He was on the 105th floor when the tragedy took place and sent an electronic message to his office in Toronto for help. 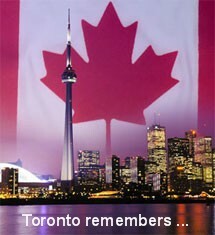 Update: September 11, 2011 Toronto Star tribute. 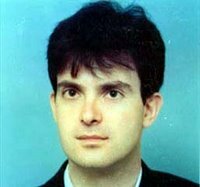 Bernard was a zealous bridge player, an executive who had risen steadily up the corporate ladder, and a man who liked to take it easy on weekends with his wife and two kids. Deeply committed to education, Bernard used to make anonymous donations to a number of different charities, in particular to scholarship funds. Among his causes, he would send scholarship donations to his native Pakistan, to assist Roman Catholics, a religious minority in that country. He also believed in giving back to the community. On major holidays, Bernard would drive the family Jeep to the grocery store to pick up donations for the Daily Bread Food Bank, his kids often in tow. He never failed to help people who fell upon hard times. Bernard was in New York for a meeting on September 11. 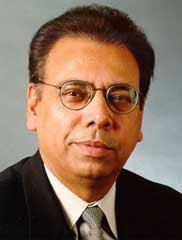 His work on computer systems at the company was known as particularly innovative and wound up being used not only in Canada but in Marsh offices around the world. "He made sure everything he worked on was a first-class product," said Thomas J. Grimes, managing director at Marsh Canada. Bernard was survived by his wife, Raynette, and a son and daughter, Jaclyn and Sven. Vladimir had been working so hard, he hadn't had time to play tennis. And tennis "was his love," says Steven Webster, Tomasevic's boss. A born athlete, he had competed in singles tennis on Yugoslavia's national league as a teen, eventually coaching tennis while he worked on an electrical engineering degree at the University of Belgrade. While tennis might have been his sporting love, he gave his heart to his wife, Tanja. The couple met while holidaying in Montenegro, fell in love and moved to Canada to start a new life. Vladimir would find a way to offer a compliment even when a compliment might seem a bit of a stretch. For instance, he always enjoyed Tanja's cooking and for good reason. She cooked well. But like anyone, she had her bad moments. "One time I oversalted some potatoes that I was baking," she said. "He ate them all, even though I couldn't. He even complimented me on the potatoes. My father was there at the time, and he said, 'You are so lucky.' Another time, it was a new recipe and I put in too much hot pepper. It was really hot. He said, 'It's a bit hot but it's good.' He was my best friend and a part of him will always be with me." This was Vladimir's first trip to New York. He was attending a Risk Waters Group conference on information technology at Windows on the World. 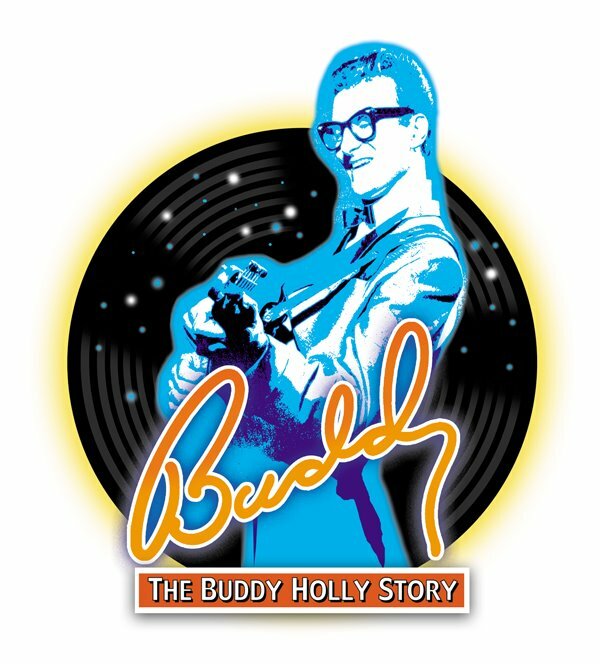 Buddy, The Buddy Holly Story is the musical sensation about the life and times of Buddy Holly. This musical takes us from Lubbock, Texas in 1951 up to 1959, Buddy's final performance at the Surf Ballroom in Clear Lake, Iowa. We follow the story of the late, great Buddy Holly through his music, featuring such hits as "Peggy Sue", "Everyday" and "That'll Be the Day" and hits from other legendary stars such as Ritchie Valens and The Big Bopper. I've never been a big Buddy Holly fan but I enjoyed this play. We all know that the story has a sad ending but the musical finale was uplifting and rockin'! Tonight I had supper with friends at Chopin Restaurant on Roncesvalles Avenue. 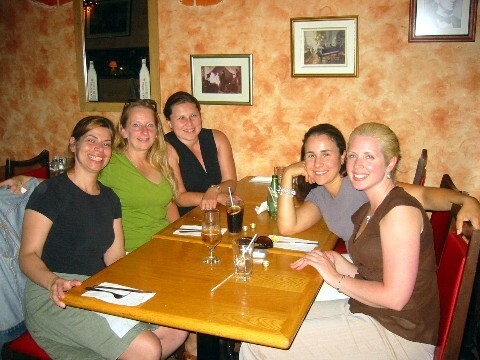 We had met in early 2005 in boxing classes Yvette used to teach and have started to get together every month or so (here's July's supper). 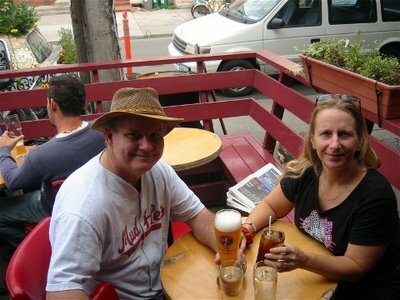 It was Beata's turn to pick a restaurant and she chose Polish, in honour of her heritage. It was great to catch up and have some laughs! 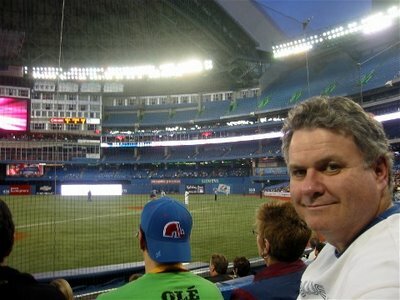 Gord and I went to the Blue Jays game tonight. I got the tix through work ~ our office buys tix every year for all the home games but usually they are given to clients or prospective clients. They are awesome seats ... row 6 in the first level, right behind the umpire. Rows 1 and 2 are $200 seats and get free pop, hotdogs, popcorn, Drumsticks, etc. These seats are two rows behind them. No free food but wicked nonetheless!! Alas, the Jays lost. They had a really bad seventh inning where the umps were making really bad calls against them. 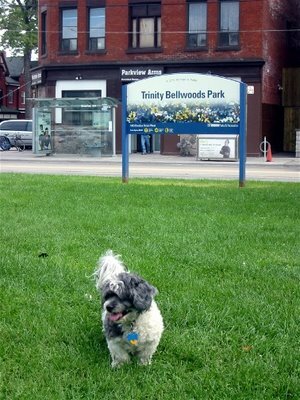 We took KC to Trinity Bellwoods Park this afternoon, which is the largest park near us (about a five minute drive away). KC loves it there! 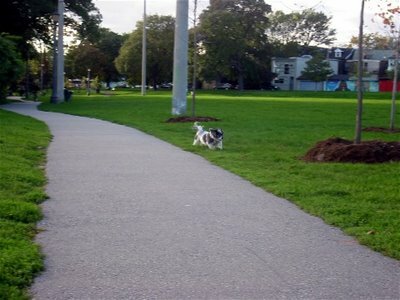 The movie, Dog Park, was filmed there. 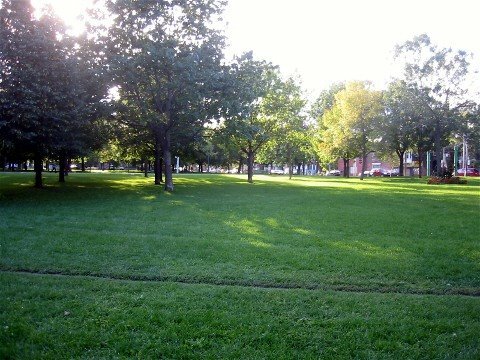 Trinity Bellwoods Park in Toronto’s western downtown neighbourhood is a 37-acre park constructed in the post-landfill remains of the Garrison Creek ravine. 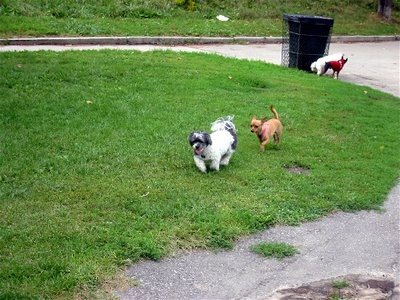 It is one of the city’s best-loved and used parks. Home to a soccer pitch, baseball field, hockey rink, tennis courts, and a recreation centre, the park hosts a significant amount of organized sports activity. 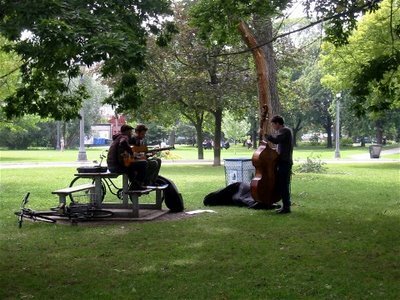 In the summer months, the park is programmed cultural festivals, a contemporary dance series, an art exhibition and a large community lawn sale.Most significantly, however, the park is heavily used on a casual basis by dog walkers, friends playing catch and cricket, parents with children, people picnicking, lovers, sledders, drumming circles, snow ballers, religious groups, late night strollers, cyclists, ultimate Frisbee players, joggers, and so forth. Any sunny weekend day - summer or winter - the park is busy. In the summer, the park is occupied peacefully all night long by dozens of locals - young and old - escaping the heat of the their homes. There were lots of people in the Park today. These guys were good! 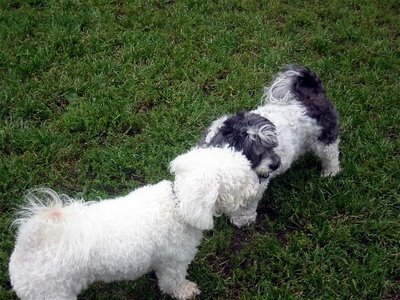 There were lots of dogs for KC to sniff. What a tired but happy girl!